What is it about about making mashed potatoes that there is always left overs? I'm convinced if we all donated our left over potatoes, we could feed small countries. This post is a little late to help you out with your left over Thanksgiving potatoes, but wait a few weeks, you'll probably have more. In this recipe, I'm giving you the base ingredients without definitive amounts. Be creative with this, adding in left over herbs and cheeses for extra flavor. Use a trial and error method of adding in just little amounts at a time until it feels and tastes correct. Don't be afraid, meat and potatoes are very forgiving. Tips and tricks: Mashed sweet potatoes would work great in this recipe. Substitute turkey for the sausage if you have left over turkey. You can bake or fry these, I opted for the baking method for a slightly healthier option. Freeze any extras, then when you need to round out dinner or fill out a to soup it will only take minutes to defrost. Place left over mashed potatoes (roughly 2-4 cups) in a large bowl. (If you have left over boiled, roasted or grilled potatoes- just mash them with a fork) It's easiest to work with them when they are warm. so warm slightly in the microwave. With a whisk, whisk all the ingredients together, slowly adding cream to thin out the potatoes as needed. You want the potato dough to be soft, but not runny; it needs to be able to hold it's shape. Cut the sausage into 1 inch pieces. Take a scoop of potatoes and place them in the palm of you hand. 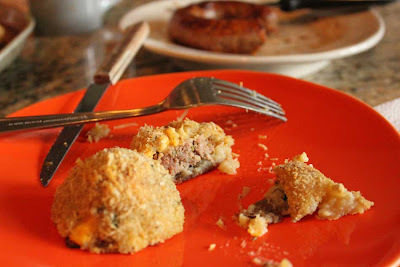 Push one piece of sausage on the spuds, then form the potatoes around the meat into a ball. 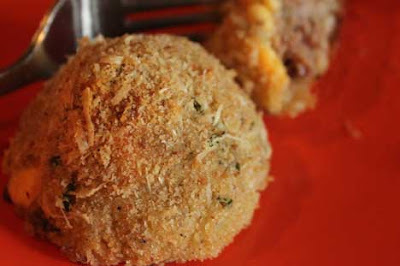 Roll the potato in a plate of breadcrumbs (I season my crumbs with parmesan cheese, pepper and salt). Set the balls on a cookie sheet and continue until you've used up the all the spuds. Bake them in the oven until the the breadcrumbs begin to turn brown and crisp.